The Silver Swan by Benjamin Black, a Mysterious Review. 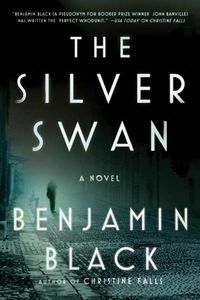 Review: Benjamin Black's second novel to feature Quirke, The Silver Swan, has the Dublin pathologist facing personal battles as well as professional ones when he fails to quell his curiosity and performs an autopsy on a woman who purportedly accidentally drowned in the sea. The autopsy probably wouldn't have even happened. Autopsies aren't required for accident victims, yet when the husband of the dead woman, an old school chum, asks Quirke specifically not to perform an autopsy, he can't help but wonder why. There's no water in her lungs and he finds a fresh puncture wound with traces of morphine in her blood. Still, for reasons he's not even sure of himself, he lies to the coroner's court and testifies that she accidentally drowned. In a case of the police chief knowing Quirke lied and Quirke knowing the chief knows this, they both begin quiet, but separate, investigations into the true circumstances of the woman's death. The sequence of events in The Silver Swan is so improbable that it almost seems is if the message here is, truth is stranger than fiction. But this is fiction. And as a mystery or suspense novel, it completely misses the mark. To be sure, the book is beautifully written with masterfully crafted narrative effortlessly flowing down the page. It's a genuine pleasure to read such elegant prose. But the plot seems incomplete or maybe it's just weakly executed. A minor difficulty in navigating this book is the intertwined inclusion of chapters that relate the backstory of the dead woman, Deidre Hunt who is also known as Laura Swan. The two timelines eventually come together in the end at a point that is supposed to be climatic but falls far short. Instead of being revealing and surprising, it's all rather expected, even routine. It's a bit disappointing. Quirke's character, already well developed from his introduction in Christine Falls, continues to evolve here. This complex man is the core of these books and one of the reasons this series excels. Read The Silver Swan because it is a superbly written atmospheric novel with multi-dimensional characters; just don't expect any mystery here. Acknowledgment: Henry Holt provided a copy of The Silver Swan for this review.